The CASLPO Office will be closed on Friday April 19th and Monday April 22nd. We will resume regular business hours on Tuesday April 23rd. Electronic VOTING OPENS April 17, 2019 and the deadline for receipt of completed electronic ballots will be Friday May 16 at 11:59 pm, 2019 for one Audiologist or one Speech-Language Pathologist in District 6, for a three-year term of office. On April 17th, all audiologist and speech-language pathologists CASLPO members eligible to vote will receive a personalized link from Brian O'Riordan to their electronic ballot through the online voting portal. For more information visit our Elections Page. In 2019, CASLPO is marking 25 years as a health professionals regulator! We are delighted to share a congratulatory letter from the Honourable Christine Elliott, Deputy Premier and Minister of Health and Long-Term Care. 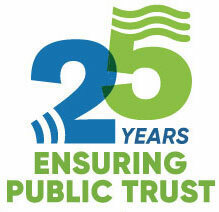 Much has changed over the past 25 years, but our priority remains ensuring public trust. We do this through the regulation of our members. Stay tuned for announcements of topics of interest and activities via email, social media and the web to celebrate our 25th Anniversary. Spread the news...share our achievements, what we do, and the advantages of regulation...because, ensuring public trust matters. We sincerely thank our publicly-appointed and elected Council members, Ontario`s audiologists and speech-language pathologists, stakeholders, and staff. Together, guided by our founding principles and our mission, everyone has worked hard to advance progress in support of protecting the public. All Ontario health regulators have a list of the professionals they oversee. This list is called the "public register." You can check the registers to make sure that your healthcare professional is allowed to practise in Ontario. On our website, click 'Find an audiologist or speech-language pathologist' from the website landing page. the individual does not provide a phone number or verifiable identifiers. The concern is that this may be a form of fraud in which an individual typically pre-pays for therapy sessions by credit card, then requests a refund before the payment is processed. The credit card payment is then declined, but the SLP has already paid out the requested refund, leaving the SLP out-of-pocket. A similar fraudulent situation has been reported in the United States. CASLPO is aware that the Ontario Association of Speech-Language Pathologists and Audiologists (OSLA) and Speech-Language and Audiology Canada (SAC) have also received similar concerns from their membership. CASLPO advises members to be wary of this individual or other attempts to commit fraud. Please report any such attempts to the College and/or as appropriate, the police, insurance providers, colleagues and professional associations. We thank all those members in Ontario who immediately contacted the College in a pro-active way so that we could take appropriate action. The Canadian Alliance of Audiology and Speech-Language Pathology Regulators (CAASPR), of which this College is a member, announced that the National Audiology and Speech-Language Pathology Competency Profiles, in both official languages, were approved by the CAASPR Board at their meeting in Edmonton, Alberta on April 29, 2018. The National Audiology and Speech-Language Pathology Competency Profiles are a key component of CAASPR's Centralization and Capacity Building Project, a project funded by Employment and Social Development Canada (ESDC). The goal of this ambitious project is to harmonize the registration processes of audiologists and speech-language pathologists across the regulated jurisdictions in Canada to provide standardized outcomes, enhanced public safety, and improved labour mobility. Learn More: Access CAASPR's announcement, and view the National Competency Profiles; click here. CASLPO Members - Are You Missing emails? CASLPO works on the assumption that all of our members get all of our emails. Audiologists and speech-language pathologists are required to receive information from the College regarding registration renewal, Quality Assurance requirements, practice advice and other important College programs and updates. Add our domain (@caslpo.com) to your safe sender list (check Help for your individual email program). We strive to keep communication relevant and to a minimum. Thank you. To review the report, click here. The College has a new set of Officers and a new Executive Committee. In accordance with the By-Laws of the College, the Council holds elections for Officers and the other members of the Executive Committee at its June meeting each year. Any member of Council, whether an elected professional, an academic or a public member, may run for the Executive Committee. All terms are for one year and members may be re-elected. As a result of the election held by Council on June 8, 2018, Bob Kroll was re-elected as President. Mr. Kroll, a Speech-Language Pathologist, represents District 6 (All Ontario). Elected Vice-President (Audiology) is Jennifer Anderson. She represents District 5 (North-East Region). Elected Vice-President (Speech-Language Pathology) is Tina D'Agnillo. Ms. D'Agnillo represents District 3 (South-West Region). These three officers of the College are joined on the Executive Committee by Véronique Vaillancourt (AUD) representing District 1 (Eastern), Ruth Ann Penny (Public Member) and Melanie Moussa-Elaraby (Public Member). The Canadian Alliance of Audiology and Speech-Language Pathology Regulators (CAASPR) announces an agreement with Speech-Language & Audiology Canada (SAC) to develop and administer entry-to-practice examinations for the registered professions of audiology (AUD) and speech-language pathology (SLP) in Canada. The College invites the public and CASLPO members to connect with us on our new Facebook page! To learn more about the Canadian Alliance of Audiology and Speech-Language Pathology Regulators (CAASPR) “Centralization and Capacity Building Project”, click here for an overview and project deliverables detail. Ontario's Chief Medical Officer of Health has asked Ontario's Regulatory Health Colleges to distribute this information. To review the cover memo and two resource documents, click here. If you work in a multi-disciplinary team and are looking for a way to easily compare what is the same and what is different when it comes to record keeping, have a look at the online Inter-Professional Record Keeping Resource. Get all the information you need in one place. This resource starts with the patient/client record and covers things like electronic records, using personal health information, financial records, record retention, leaving or closing a practice, record destruction and more.